Nigerian soldiers killed 37 bandits and rescued 80 kidnapped people in Zamfara in two weeks, an official said. Six soldiers also died in the operations in the troubled state, Clement Kabaide, the acting spokesperson of the army in the region said in a statement on Saturday. ‎The rescued victims include men, women and children. The operation was conducted between February 4 and 14. ‎Mr Kabiade did not provide details of how the soldiers died but said they died in Bini Maru Local Government Area while returning to base. He said six suspected bandits and their allies were also arrested while several weapons, ammunition and rustled cattle were recovered. "The troops have continued to dominate the Areas of Operation with aggressive patrols. Troops also maintain day and night patrols deep into the forest areas and points/routes to deny the bandits freedom of action while building confidence of the locals. "The troops also had several encounters with bandits during the period in focus and neutralized 37 bandits. A total of 6 suspected bandits informants, rustlers, kidnappers and logistics suppliers were arrested during this period," the spokesperson said. Mr Kabiade said the suspects will be handed over to the police for investigation and possible prosecution. He said the air component of the military operation, called SHARAN DAJI, carried out "several air strikes around Dumburum Forest." "The subsequent mop-up operations in Dumburum Forest led to the rescue of 80 abductees. The abductees consisted of men, women and children from communities in Zamfara State," he said. 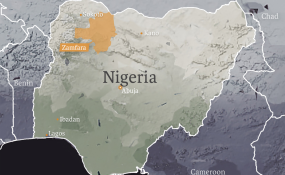 Hundreds of people have been killed in Zamfara in the past year by armed bandits who invade towns at will. Many have also been kidnapped for ransom by the bandits who have continued their activities despite the efforts of security agencies.